Let’s face it (and in this case see our reflection) wooden instruments sound and respond amazingly as the tried-and-true substance of the player’s instrument, but as the world turns, quality tone-woods’ demand may not be in sustainable supply forever. Now that we are on the topic of sustain, lend your eyes and ears to a whole new guitar company that propels the sonic explorations of Travis Bean, Marc Mcelwee, John Veleno (and any other luthier you want to throw in the mix) into the seemingly limitless future. Kevin Burkett started Electrical Guitar Company out of “total admiration for the aluminum guitar.” He then took his predecessors’ visions a step further and created entire instruments made of aluminum (no wood) finding a unique brilliance, chime, attack and snarl that has not been heard previously. Since inception, he has fearlessly taken on just about any customer request imaginable and produced some of the wildest, most beautiful and eclectic custom instruments available. Today’s review is my EGC Standard Series Two # 586. Now, normally you would be a fool not to dream and bounce ideas back and forth with Kevin, but me being the Mosrite, Veleno and Travis Bean fanatic that I am, the dream had already come true. A veritable tri-force of tone. I always wanted a Mosrite slab body Ventures II (RIP Johnny Ramone) and when I saw this beauty, I knew my custom EGC had already been created. Digging in for the first time was a revelation in resonance. Smack a complex chord and you are rewarded with flashing shards of chiming, swirling overtones that ring out all over the guitar. You may be conditioned to assume that when you see an all metal guitar, you are going to get a harsh, biscuit-resonator, honky midrange attack that is only good for slide or blues….not the case at all. In fact, the entire frequency spectrum is amplified in ways wood alone just is not capable of on it’s own and we have not even plugged in yet. When amplified, we see just how brilliant the whole design comes together. A two piece hollow T6061 body encapsulates a billet T6061 neck, with hand-wound alnico 5 P-90 pickups that because of this design, respond to your picking attack with unparalleled accuracy and immediacy. What you put in is what you get out. In much the same way as you feel when plugging into a Fender Twin it is peek-a-boo time. Even with a substantial amount of gain, you won’t be hiding behind anything. Don’t thing for a second that this is a bad thing. You can hear every string cut through a dense web of effects, fuzz or drive when you want to get crazy, or hear the softest touch of nuance from your left or right hand when clean. For every high frequency added, the lows and mids come in too. Some people use an EQ pedal for this purpose. Throw that thing aside when you wield an EGC. The blanket has lifted now. Once you get used to this it is hard to turn back. 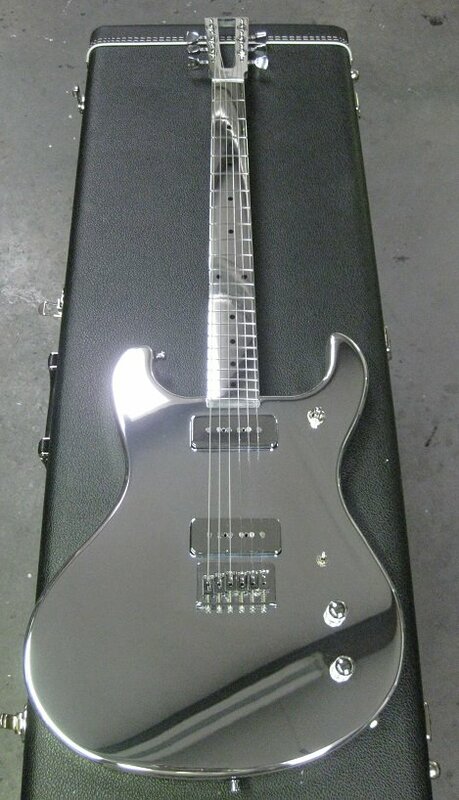 Some more amazing attributes to EGC’s all-aluminum guitar are the immediate pick attack and indestructible metal body. Because of the pickups being attached directly to the neck, the percussive elements of your playing are enhanced. I even discovered that beating the body of the guitar like a futuristic Bodhran can give you and your drummer a whole new musical relationship that Einsturzende Neubauten would be proud of. Besides the magical aural and visual experience of Electrical Guitar Companies creations, the practical weighs in heavy as well. You will NEVER have to adjust the truss rod again. Set it up once in a lifetime if you want and next time some half-wit-all-eyes-on-me heckler, hipster or punker spits on you, throws a $10 Dollar beer on you, or puts a cigarette on you for attention….use it as weapon and wipe the blood of with a rag when your set is finished. Kevin’s got the biggest little business down on the block. His clientele grows every day with seasoned vets like Duane Denison, Buzz Osborne and Steve Albini leading the pack. Click the link and get in touch with Electrical Guitar Company now and turn your dream guitar into a reality. For the demo below, I threw a Sennheiser E609 in front of my trusty Laney Lionheart L5T and bashed through all the pickups configurations clean and dirty with one of my little riffs. Hi: �Loved reading and hearing your review.